So, it’s been ages since I’ve written anything. When I started this, I intended to chronicle the training for my first marathon. But life got in the way. In late January, I left my job of seven years for a new one, and ended up getting the flu the very first week. It’s hard enough to make that type of a change to begin with, much less when you’re not feeling well. I recovered, but the cough lingered for weeks. Eventually, I started settling in at work, and now I really enjoy it. But those first few weeks I didn’t have any extra energy for anything, not even writing. I also started to have doubts about whether or not I’d actually be able to finish the marathon. I was almost afraid to write about it, for fear that I’d then have to come back and write about how I didn’t make it. The last couple weeks have changed that. Last week we did an 18 mile run in the snow. And I mean, with snow and ice hitting us in the face. 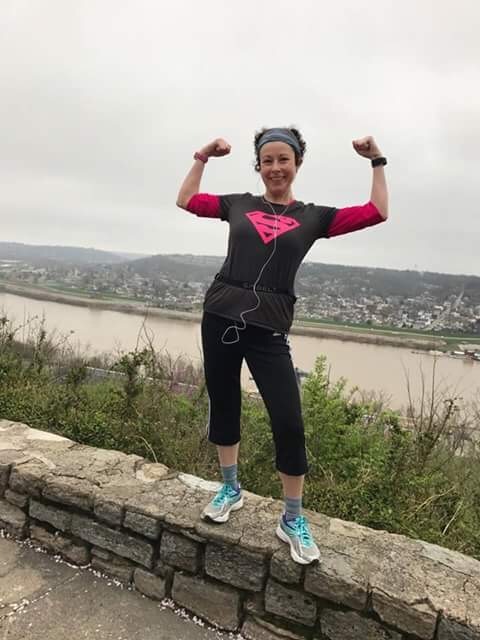 It was miserable, and I could never have gotten through it without my Tri-State Running family, especially my running bud, Beth, who lent me her gloves when my hands were freezing and I was about to hit the wall. It was rough, but we did it. Yesterday, we did 20 miles. It started out chilly and foggy, but ended up being a really nice day. I noticed as the miles ticked by, that I felt good, and it didn’t seem that far. My knee gave me a little trouble on a downhill, but I walked 3 miles today and it’s feeling better. So, yeah, I finally believe I can really make it through those 26.2 miles. We’ve got 5 weeks to go, and I’m ready. Let’s do this! Next Next post: The joy of tapering, and one week till the Pig!